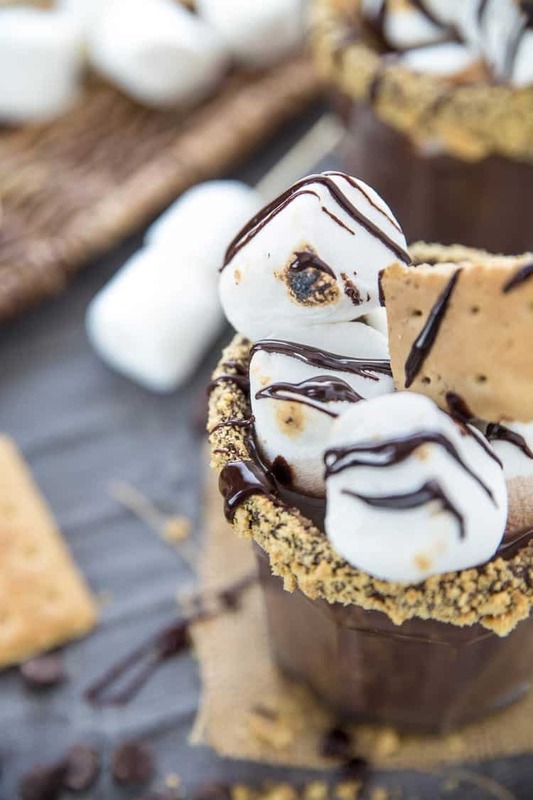 It’s summer now and all things S’mores are fair game. 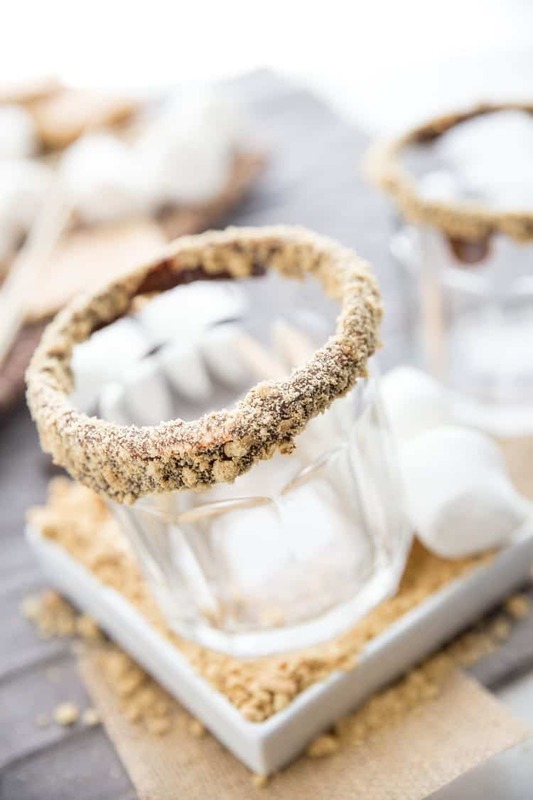 Start your summer off right with this Dairy-Free S’mores Cocktail. Why should you have to choose between dessert and drinks anyway! With this one you don’t have to! In this post, I tell you exactly how to lighten this specific drink up, but I also want to tell you how I make each and every one of my cocktails guilt-free. Hello Friday! I don’t know about you, but my week just flew by because of the Memorial Day holiday on Monday. With Memorial Day behind us and kids either already out of school or will be very very soon, it seems like we’re officially in the throws of summer. Hell, just this weekend, Utah is cranking up the outdoor thermostat to a blazin’ ninety-six degrees! I mean, really… are those extremes really necessary out of the blue like this? I think not. After such a mild spring, I’m not sure I’m ready for this. Bring on the AC, cold-brewed coffee, salads all day every day, and of course the delicious cocktails to cool you off every night. Am I right or am I right?! Obvs. <— dumbest abbreviation ever. only because it’s nearly impossible to actually say out loud. Just a couple weeks ago when my amazing blogging BFF, Taylor (of the wildly popular site Food, Faith, Fitness) was in town for a conference, we were talking about food… because, duh, that’s just what us foodies do. She asked me if I’d rather have an actual dessert like cake, ice cream, or brownies or if I’d rather have a cocktail for my dessert. Turns out, that was one of the hardest questions I’ve ever been asked and I had no answer for her. What a conundrum to have! I do not wish that decision on anyone. What torture to have to pick just one, right?! Ok, I could have had worse problems. When it comes down to it, once I actually put some thought into it, the dessert vs. cocktail decision isn’t actually all that hard for me. Only because I know the potential for over-the-top cocktails. You know what I mean, right? 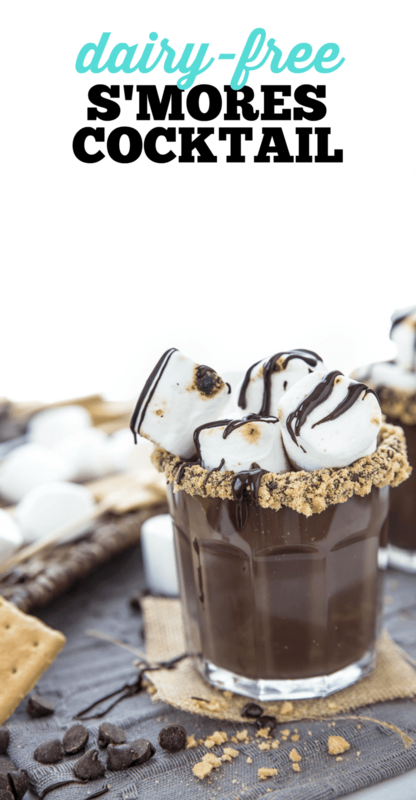 Whipped cream piled high, chocolate drizzled all over the top, glasses rimmed with tons of sugary deliciousness. 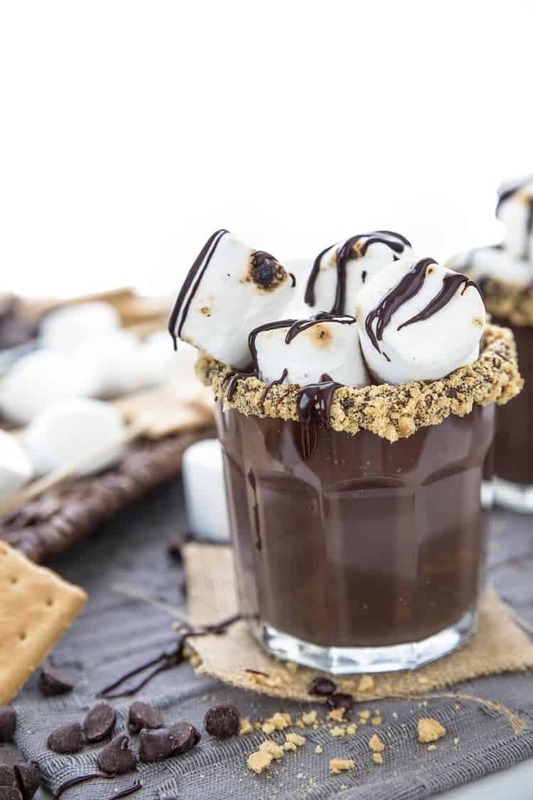 Basically dessert in a glass. Drinkable dessert, if you will. So many of those dessert-y drinks end up being cream-based, which is fine and all, but not when you are about 90% dairy-free (cheese… i love me some cheese). So what’s a girl to do? Thankfully, Silk has come out with a dairy-free solution for all my dessert-cocktail needs. And there are plenty! 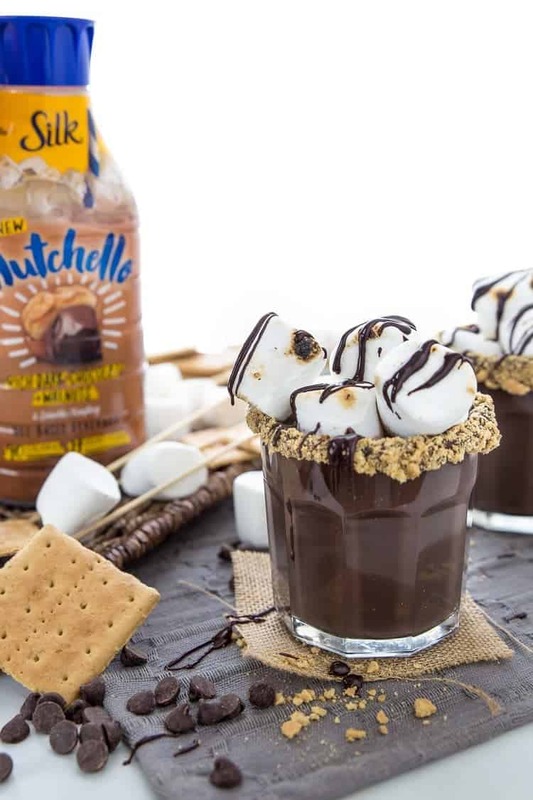 Nutchello comes in 3 different flavors, so I can make all kinds of different drinks. I mean, the possibilities are endless with those options. I’m already thinking about some sort of salted caramel situation going down with that last one. This time around, I opted for the classic flavor of S’mores to start the summer off right. I mean, you really can’t go wrong there. 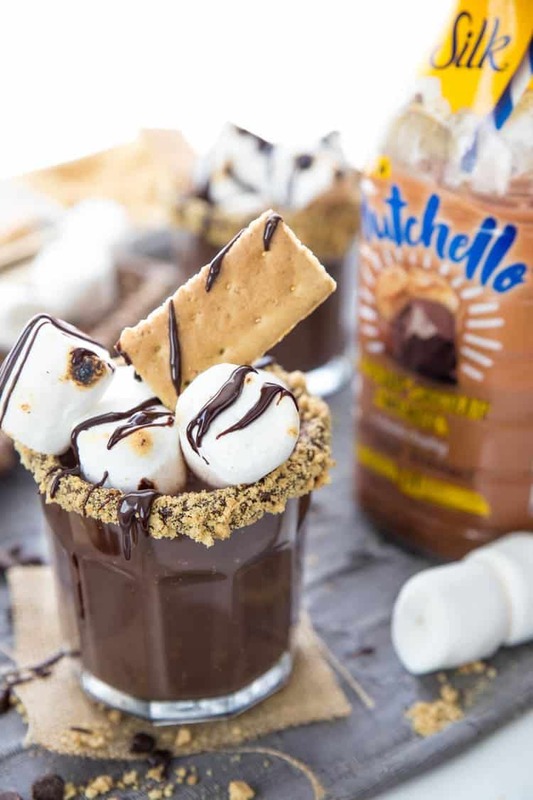 On top of all the fantastic flavor options, there’s also the fact that Nutchello is naturally lower in sugar, fat, and cholesterol than any other cream or milk-based options you would normally include in your dessert cocktails. That’s a total win in my book. That’s when you basically stand up, take your adult bevvy in the other room, and say, “no little person; it would be entirely irresponsible of me to share this with you,” and go enjoy your ‘me-time’ alone with your dessert cocktail. Anyway, I think we’re getting off track. The point of the story here is that it’s summer now. Dairy-free so as not to piss off your belly. Because there’s only one thing worse than being in the dead heat of summer. Being in the dead heat of summer with a case of an upset stomach that’s just making you sweat even more. No thank you! 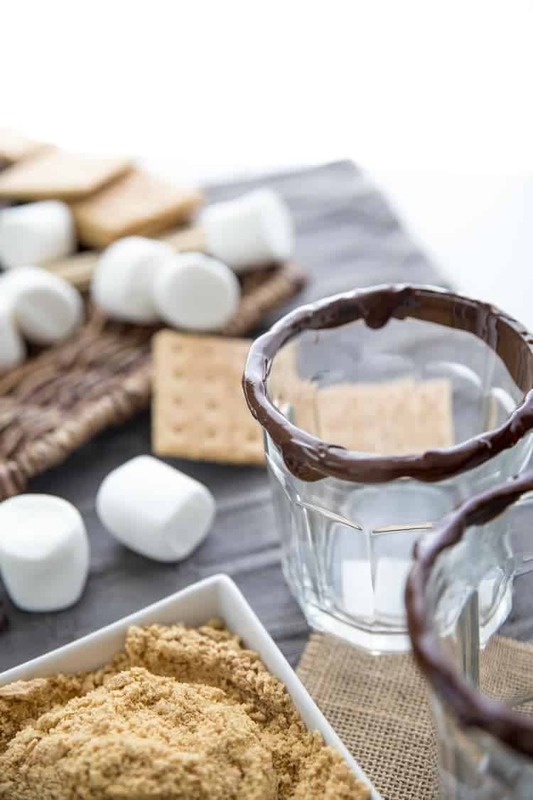 S’mores because, well duh – it’s summer so all things s’mores are fair game. Cocktail because there’s just something magical about drinking a nice cold beverage on a hot summer night. Dessert + Cocktail all in one?! AND it’s #dairyfree … sign me up! And don’t forget to get my top 10 tips for making and ordering each and every one of your cocktails lighter. 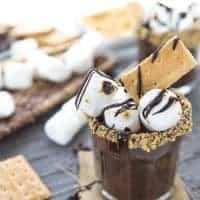 To prepare the chocolate for your garnish, microwave chocolate chips and almond milk in a microwave safe bowl for about 30 seconds until melted. Whisk chocolate and milk together until combined completely. 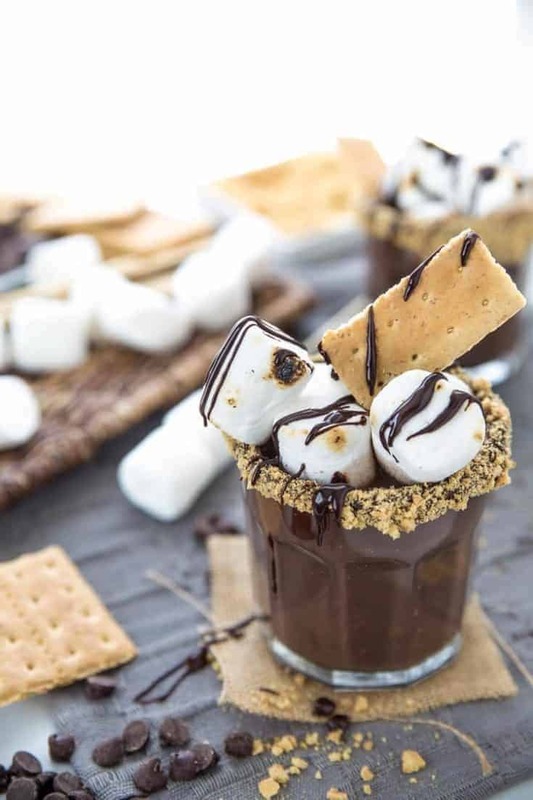 To garnish the rim of your lowball glass, carefully spoon chocolate around the edge of the class. 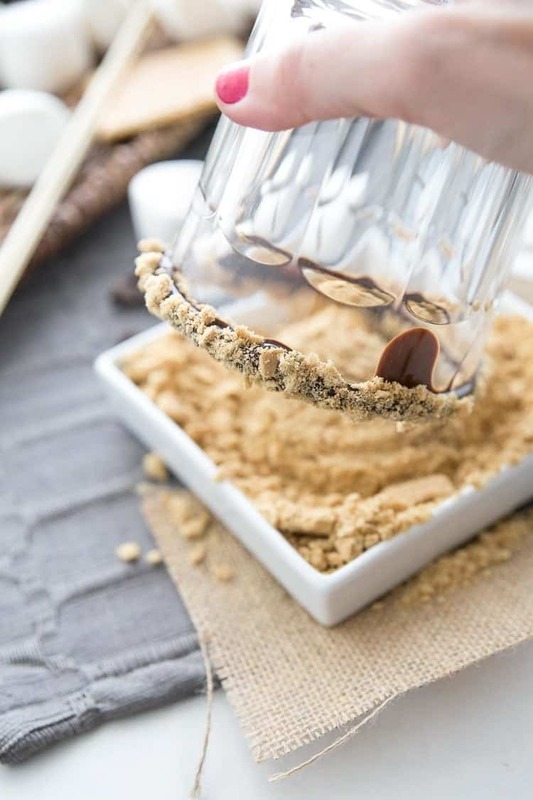 Dip glass onto a dish of graham cracker crumbs. Set aside. In a shaker, combine vodkas, Nutchello, and ice. Shake well. 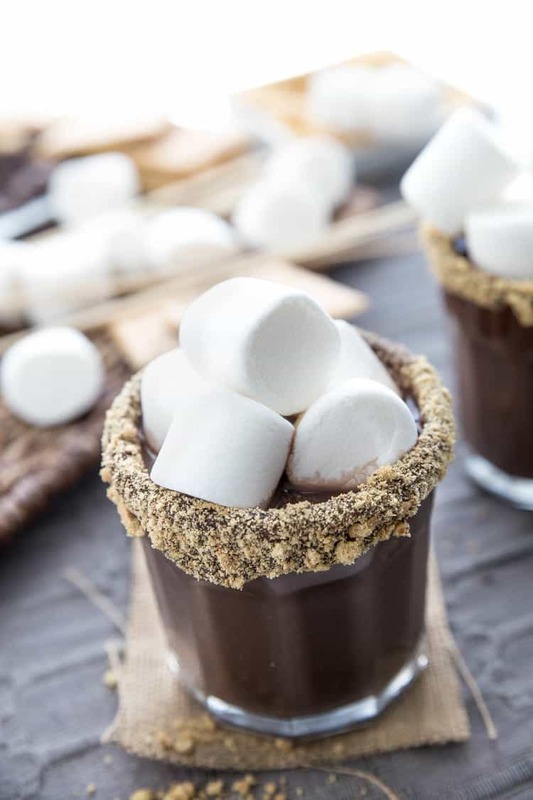 Pour cocktail into the garnished glass, top with marshmallows, toasting with a kitchen torch if you'd like, and drizzle with chocolate. makes 1 cocktail. 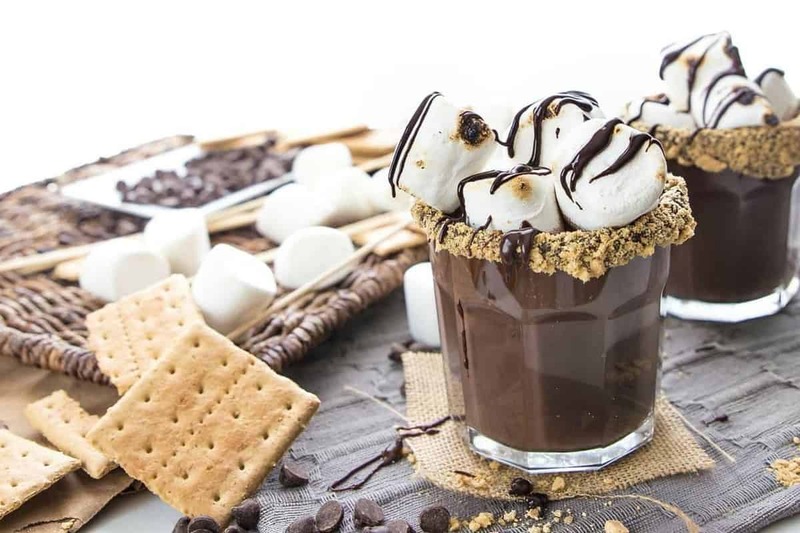 If you'd like to make this vegan, feel free to use vegan marshmallows. 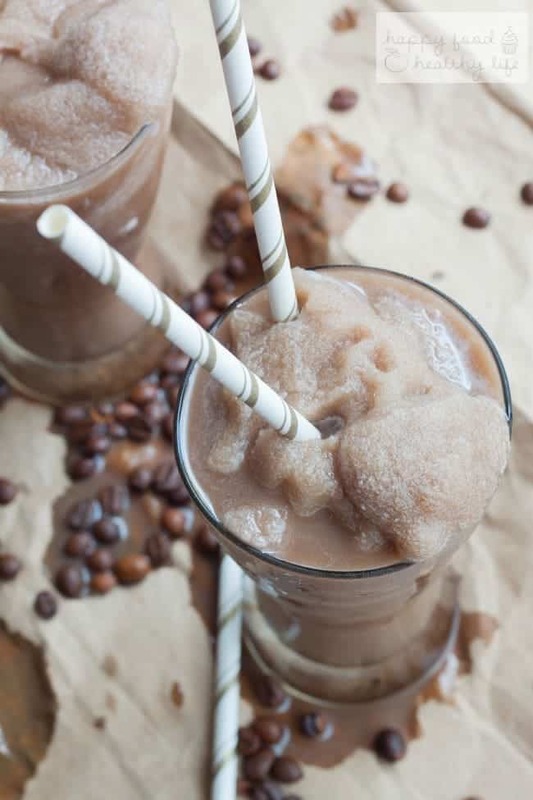 If you don't care to make this dairy-free, you can use chocolate milk instead of Nutchello. Looking for more cocktails this summer? Check these out! 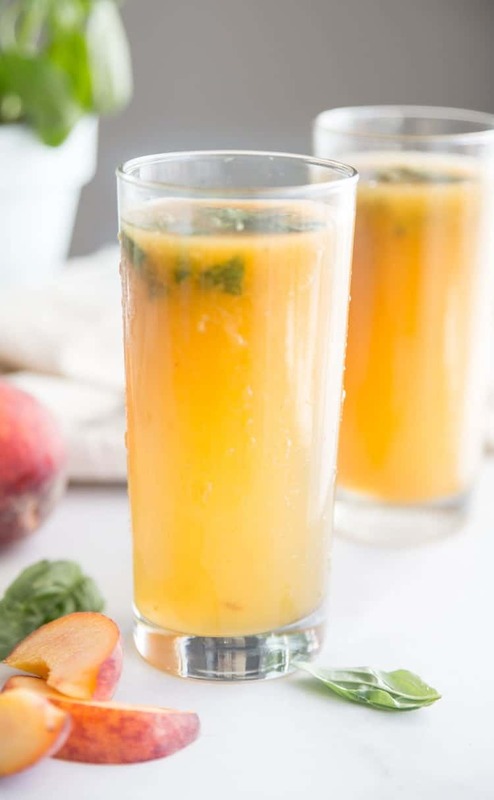 Peach Basil Whiskey Cocktail – Make a fresh cocktail right from your herb garden. If you liked this post, make sure you share and save it on Pinterest, Facebook, Twitter, StumbleUpon, and Yummly with the buttons below. Holy smackaroos that looks so good!